HP CP1525N is a great choice for any heavy printing needs and is a great choice for any office or workspace. It gives professional-quality colour to the print outs. It is known for its low operating costs and is an environmental friendly option. HP CP1525N is built to handle multiple print jobs and boasts high quality colour as well as black and white prints at great speeds. The colour HP LaserJet Pro CP1525N toner cartridges have a life of just 1,300 pages. It is a sleek printer that looks professional due to it’s curved white front and black body. The printer has a 150 page feeding tray and a 250 page output tray. 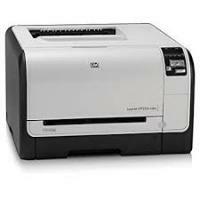 This printer can print at 600 x 600 dpi in both colour as well as black and white mode. The rate of printing is 12 ppm in black and white mode and 8 ppm for colour pages. HP LaserJet Pro CP1525N printer is a great choice for any office or workspace and gives professional-quality colour to the print outs. This printer is a good option when a wide range of media types are to be printed but for the users who want double sided printing and ease of installation, this printer may not be a great choice. Q. I am confused as I would like to purchase a pack of compatible HP LaserJet Pro CP1525N toner cartridges but to get the best quality and performance should I go for the genuine cartridges? A. One will get equivalent print results using the compatible cartridges at cheaper rate than the original ones. The compatible toner cartridges are manufactured with the best materials keeping focus on its quality, durability, and performance that are exactly similar to the original cartridges. Q. What are the chances of getting extra discount if I place an order for more than one multipack of HP LaserJet Pro CP1525N toner cartridges? A. We offer an exclusive discount on multipacks or on the bulk purchase. If you buy more than one multipack of print cartridges it will greatly reduce the cost per page annually. Furthermore, we promise to process a money back guarantee if you are not satisfied with the efficiency and performance of the cartridges. Q. What are the advantages of using HP LaserJet Pro CP1525N printer? A. The main advantage of using HP LaserJet Pro CP1525N printer is that it supports a wide range of media types such as paper (bond, brochure, colour, glossy, letterhead, photo, plain, preprinted, pre punched, recycled, rough), transparencies, labels, envelopes and cardstock. Furthermore, maintenance is easy and replacing HP LaserJet Pro CP1525N toner cartridges does not take a lot of time. Q. Can I purchase only the magenta colour for my HP LaserJet Pro CP1525N printer? A. Yes, the printer employs all 4 HP LaserJet Pro CP1525N toner cartridges individually so you can buy magenta toner separately. Likewise, all the colours black, cyan, yellow, magenta can be purchased independently from this site. Q. How can I do the payment for my order? A. You can pay by Laser Card, American Express, MasterCard or Visa Credit Card, Maestro, Switch, Solo or Delta Debit Card. When you purchase an item on this website the payment will be hosted by Sage Payments to ensure maximum security of your credit/debit card details. For further details go through https://printerinkcartridges.ie/terms-and-conditions. Q. Is the ink volume of the black toner cartridges more than that of colour toner cartridges in the HP LaserJet Pro CP1525n toner cartridges pack? A. Yes, the colour toner cartridges carry an ink volume that prints 1,300 pages while the black cartridge prints about 2,000 pages. Q. Are compatible HP LaserJet Pro CP1525n toner cartridges able to endure frequent printing jobs without buckling under pressure? I want to change the original toner cartridges I’ve been using all along. Would you recommend these cartridges for printing in bulk regularly? A. Yes, you can switch over to these compatible HP toner cartridges without any hesitations, they are a pro at printing fine, sharply vivid documents in bulk on a regular basis. We conduct strict quality assurance tests that include ensuring selecting only those cartridges that print continuously, like these toner cartridges do. Q. Do you offer a money back guarantee on the purchase of compatible HP LaserJet Pro CP1525n toner cartridges? Are they really as good as original cartridges? A. You will be eligible for money back guarantee when you buy compatible toner cartridges from us. These are high-quality toner cartridges that are also fully guaranteed. They provide rich colour vibrancy and print with the finest laser-quality black text for you. Compatible cartridges are on par with genuine cartridges in every way; in fact, they are more cost-effective and so turn out to be a better deal. Q. Is exposure of printers’ drum unit to strong light like bright sunlight harmful for it or is it ok? A. Please don’t ignore this printer warning and buy a new drum unit. Q. Can I expect reduced downtime if I install compatible HP LaserJet Pro CP1525n toner cartridges in my printer? A. Yes, these HP toner cartridges are built to reduce downtime collectively for your benefit.